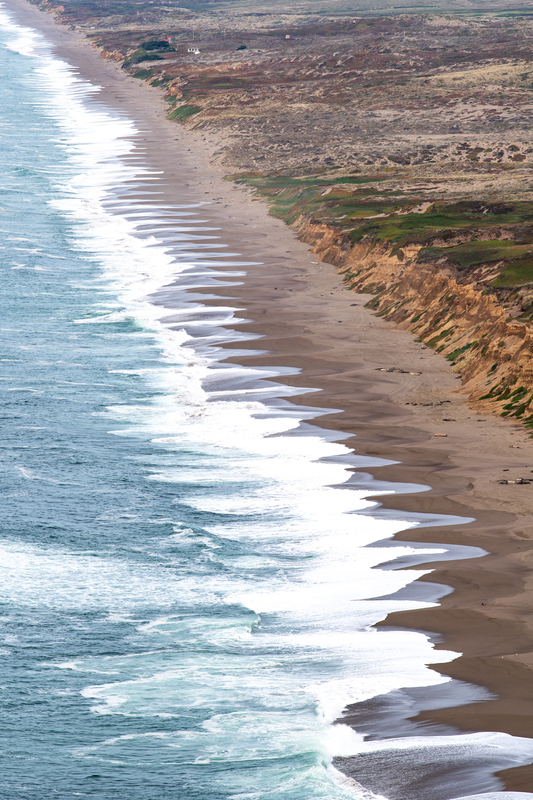 When David’s mom was preparing for her visit, the one place at the top of her list was Point Reyes National Seashore. 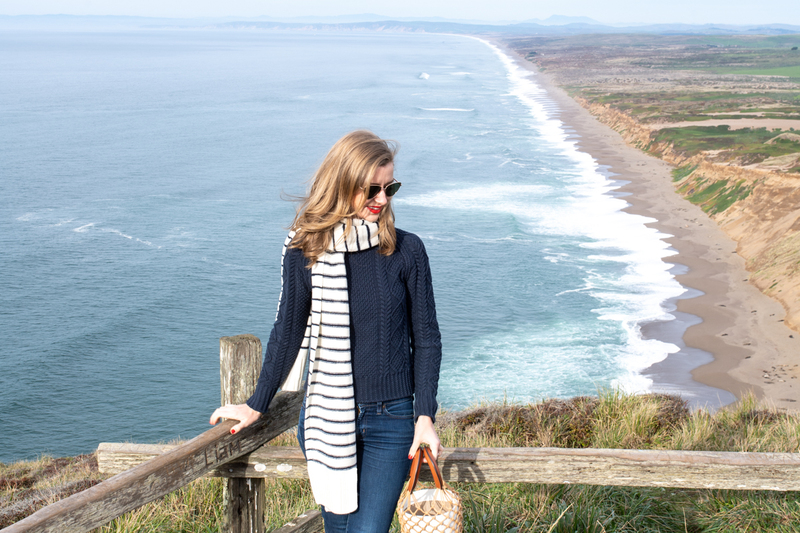 David and I have been up here for hikes and oysters several times and love the laid back vibe in the coastal cities just north of San Francisco. So, last Saturday we had a long brunch then piled in our tiny car to drive up. It’s 90 minutes to Point Reyes Station and we stopped to pick up a few snacks at Toby’s general store in town before continuing the final 30 minutes to the lighthouse and national seashore. 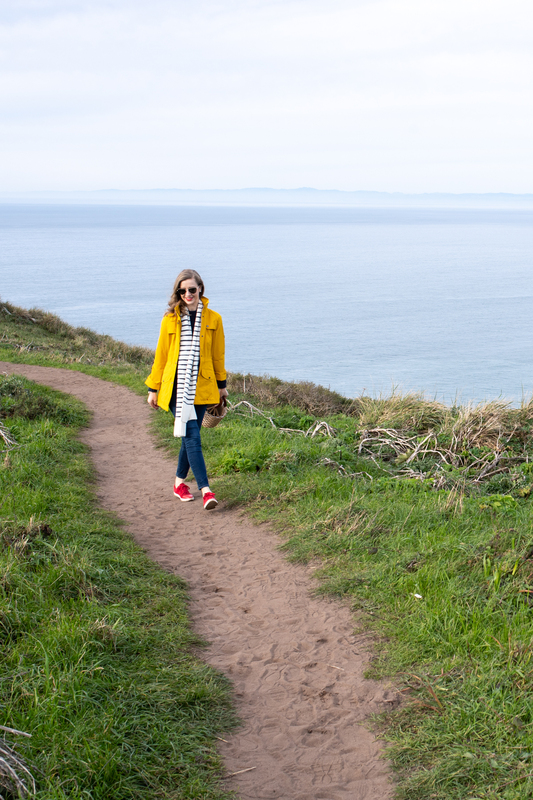 Unfortunately the Point Reyes Lighthouse is closed for renovations right now, but we had fun riding with the top down and taking in the views from the hiking trails around the lighthouse property. 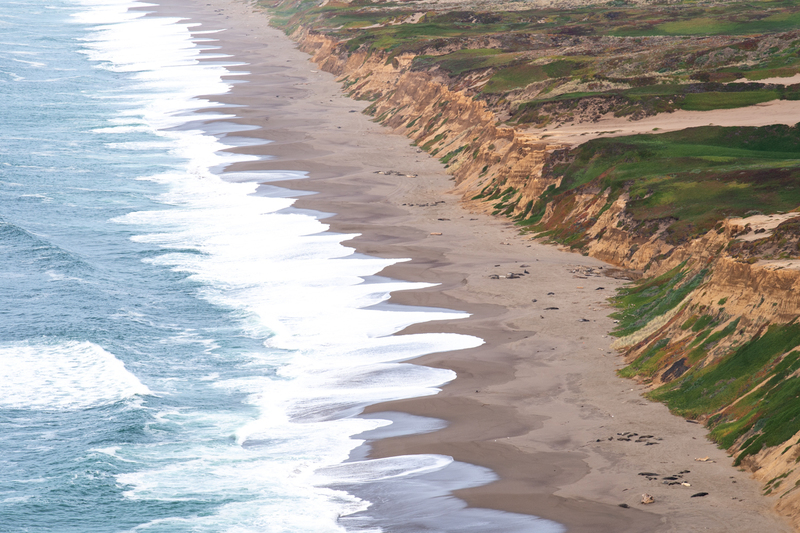 We could see seals sunning themselves on the beach below and tule elk wandering the cliffs. 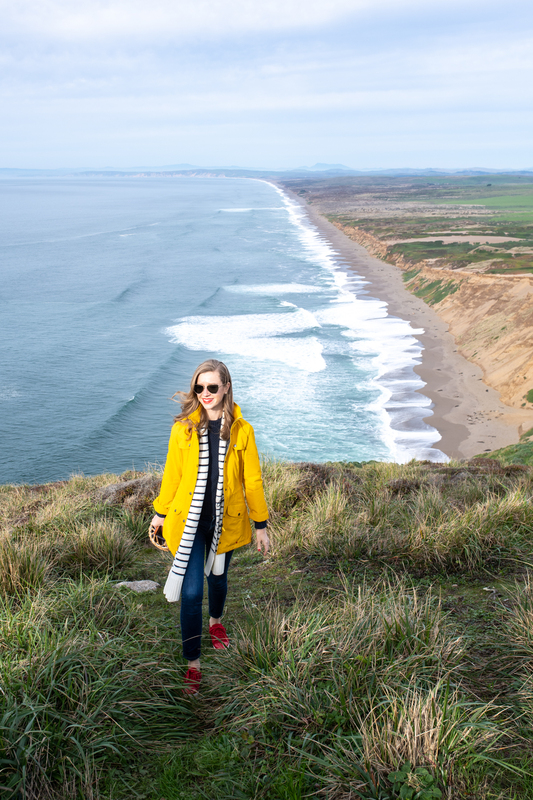 This time of year is also good for whale watching as over 20,000 California Gray Whales migrate from Alaska to Baja California, but we didn’t catch a sighting on this trip. The migration happens from mid-December to mid-February, so if you go soon you might be lucky! Since we were headed to the shore I pulled out some of my more nautical pieces for the day. 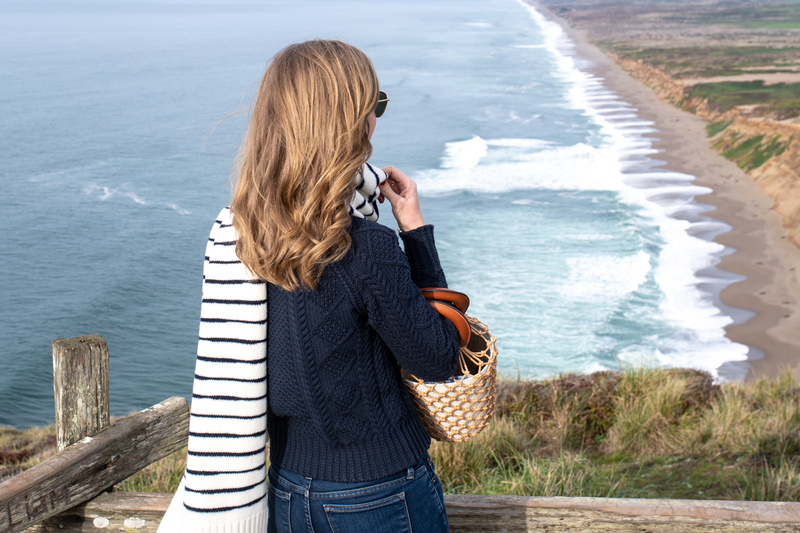 I love this fisherman’s sweater by L.L.Bean so much I have it in both colors, this navy version (currently on sale) and the natural one as well. It’s a heavy cotton with an exaggerated knit at the neckline that feels really old-school and current all at once. 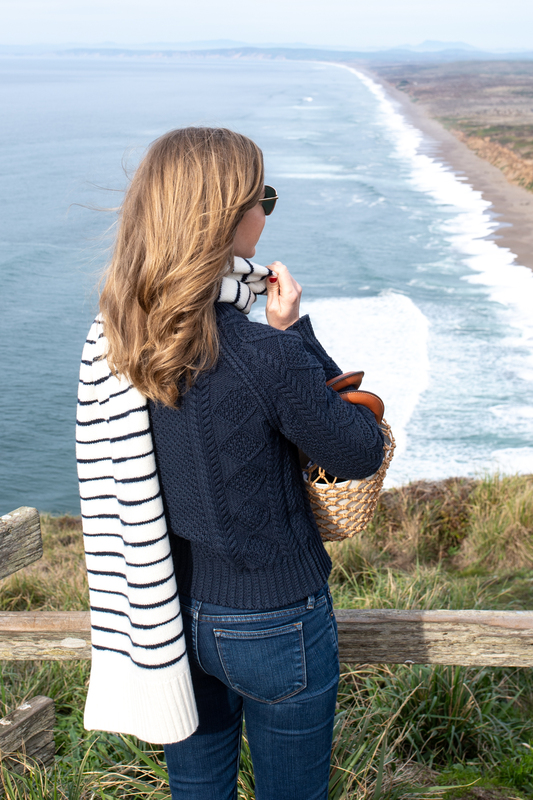 They’ve been making this sweater for years and it hits at high hip so it’s best with higher waisted jeans, or you can size up for a more relaxed look. 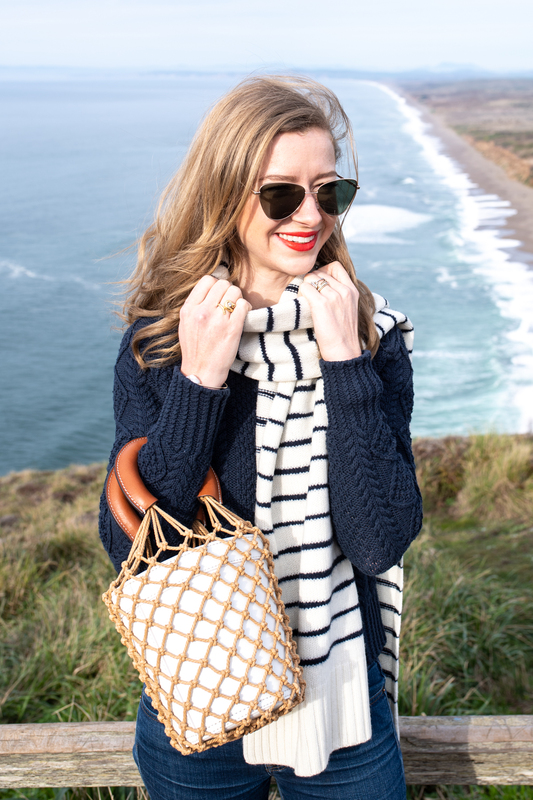 I wore this sailor striped scarf almost every day during our Vermont trip last month, but this one by the king of all sailor clothing, Saint James, is just as cozy and versatile and much less expensive. It’s likely you’ve seen this bag many times before. I would normally avoid purchasing such a trendy piece, however it was the nautical vibe that got me. I can’t wait for the weather to get warmer and pull this bag out on a regular basis to pair with everything from white sundresses to shorts, a sweater, and flats. If you follow me on Instagram you know we love to hike to the top of Twin Peaks in San Francisco. Since most of my regular workouts are barre or yoga, I don’t have a pair of athletic sneakers at the moment and have been wearing this pair by Cocktail Sneakers. 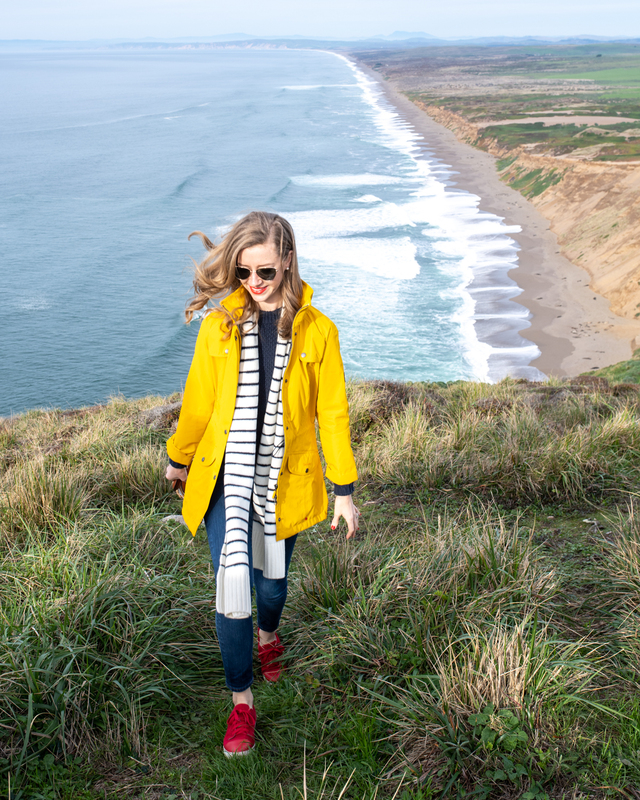 They’ve been perfect for moderate walks and hikes and a little more polished than an athletic shoe. They’ll be coming out with more colors this spring and I’m really hoping they have navy and/or camel versions in the works! 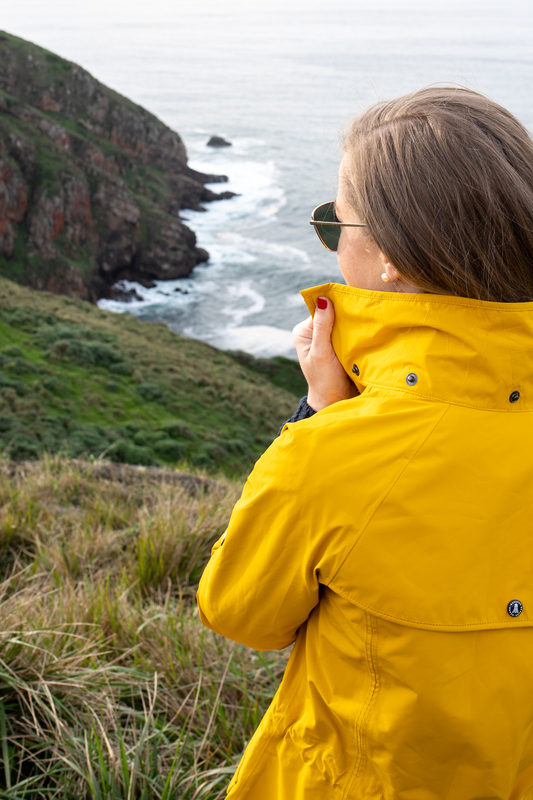 The shoreline is extremely windy, and I brought along my yellow raincoat to cut the chill. 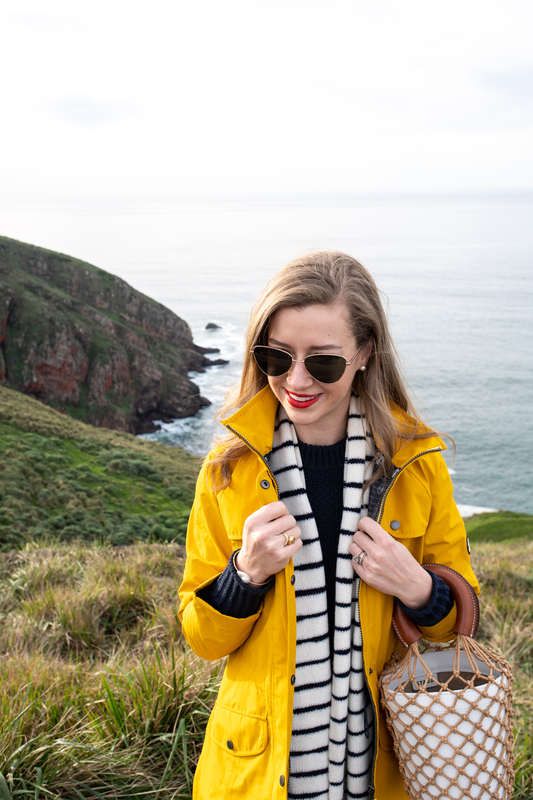 I’ve had this jacket for years but haven’t featured it on the blog before. 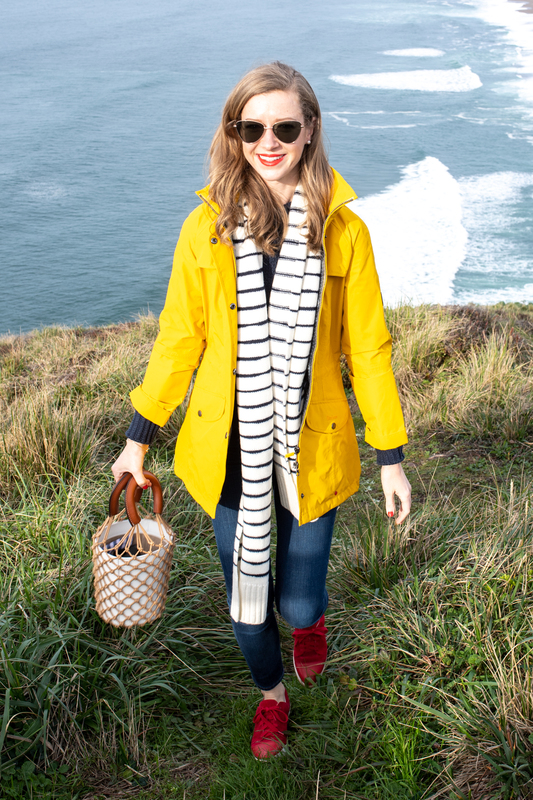 It’s an old design by Barbour but I found the same style in a fresh blue and white stripe that is really cute, or this almost identical yellow raincoat here. 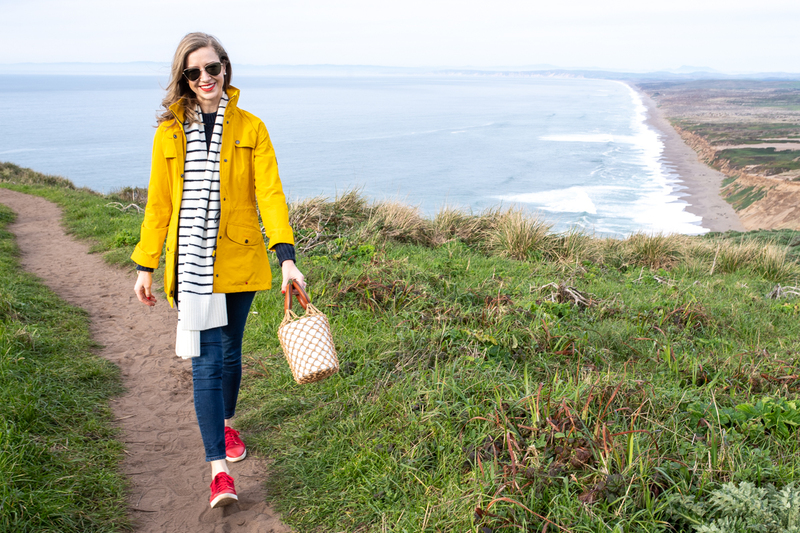 There’s something about a classic yellow raincoat! After walking the trails around Point Reyes we started the journey home, stopping in Sausalito for dinner at Copita to give David’s mom a taste of another North Bay town. I first learned of Copita from Chrissy of Harlowe James who lives in Sausalito and wow! It was completely delicious, reasonably priced, and we snagged the last little table outside. We were perfectly cozy under the heat lamps as we watched couples stroll the Main Street on a Saturday night. Typing this makes me want to rush back for lunch! What a beautiful place. I love your outfit!